Saint Louis receiver Kuli'a Aiona ran ahead of Punahou's Troy Yasuda in the first half of last night's game at Aloha Stadium. Two worlds collided at Aloha Stadium, and thanks to Micah Mamiya, the Crusaders are marching in front. Mamiya, returning after suffering a hip injury, stymied a remarkable Punahou comeback by leading a key drive late in the game as No. 2-ranked Saint Louis fought off top-ranked Punahou 38-35 last night. Saint Louis nearly blew a 31-point lead in the second half, but Mamiya recovered from his injury just enough to save the day. After Punahou pulled within 31-28 with 5:14 to go, Saint Louis was in serious trouble with an offense that managed just 27 yards in the second half. On his first play since the second quarter, Mamiya immediately ran off the right side for a 63-yard gain, and three plays later, he lobbed a 13-yard touchdown pass to Josh Saio. That gave the Crusaders some breathing room with a 38-28 lead and just 3 minutes to play. Brett Kan, who threw for 219 yards and three touchdowns in the second half, led Punahou on an 11-play, 72-yard scoring drive. His 1-yard bullet to Miah Ostrowski brought Punahou within 38-35 with 53 seconds to go. However, the ensuing onside kick by River Kim spiraled off-target and glanced off the back of a Punahou player, giving Saint Louis the ball and a narrow win. Their effort overcame a 385-yard passing night by Kan. 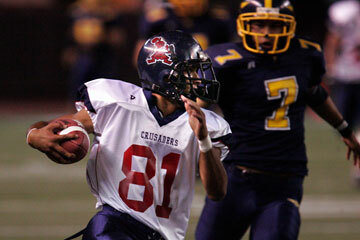 The Crusaders remained unbeaten in Interscholastic League of Honolulu play at 2-0 (5-0 overall). Defending ILH champion Punahou is 1-1 (4-1 overall). Mamiya threw for 127 yards on 8-for-13 passing and ran for 113 yards on only eight carries. The Crusaders were turnover-free and finished with 332 total yards, but if there was any doubt that they could beat Punahou without Mamiya, it was vanquished last night. "We had the lead and we wanted to rest him," Saint Louis coach Delbert Tengan said of Mamiya's injury. "Punahou's got so many weapons and a lot of pride. We knew they had the ability to come back. We had some silly penalties." At the onset, Saint Louis looked like the fresher, crisper team. The Crusaders, who had a bye last week while Punahou banged heads with Kamehameha, rolled to a 31-0 lead by halftime. "It went like how we scripted it at practice," Tengan said. The Buffanblu drew a bit of consolation in the loss. "No matter what, you don't quit when there's adversity in a game or in life," Punahou coach Kale Ane said. "It wasn't the best way for us to start, but it was great to see our team dig down deep and come back. Saint Louis had great effort. Their offense is quick and versatile, and their quarterback was outstanding." So was Saint Louis' defense, at least for a half. Punahou did not penetrate Saint Louis territory until the second half, and even then, Kim was wide left on a 43-yard field-goal try. While the Saint Louis defense locked down, its offense was sterling. With excellent field position, Mamiya directed the Crusaders to points on all but one of the first-half drives. They opened the game with a six-play, 80-yard drive, sparked by Mamiya's 52-yard strike to Kuli'a Aiona. Mamiya capped the march, faking to his running back and sprinting to paydirt for a 6-yard touchdown, and the Crusaders led 7-0 with 9:31 left in the first quarter. Punahou came out with errant passes and yellow flags from the start. Saint Louis scored on its next series, a five-play, 73-yard drive. Shane Ahlo, who dropped a pass on an out pattern, came back on the ensuing play and with a streak from the slot. Mamiya found him in stride for a 29-yard touchdown, and the Crusaders led 14-0 with 5:37 to go in the opening quarter. Punahou mistakes gave Saint Louis more opportunities. A high shotgun snap sailed over Kan's head at midfield, and linebacker Aaron-Jay Awa returned the bouncing ball 15 yards to the 12-yard line. The drive stalled at the Punahou 5-yard line, and Kenton Chun chipped in a 22-yard field goal to give Saint Louis a 17-0 lead with 11 seconds left in the first quarter. Another turnover took the wind out of Punahou's sails. Facing a blitz, Kan threw an errant pass intended for running back Dalton Hilliard, and defensive end Solomona Aigamaua returned the interception to the Buffanblu 12-yard line. On the next play, Mamiya went back to the same play that gave his team its first touchdown. The senior faked to his running back and raced untouched into the end zone for a 12-yard touchdown to give the Crusaders a 24-0 lead with 9:37 remaining in the half. Patiently, Saint Louis marched 80 yards in 12 plays late in the half to extend its lead. A 24-yard pass from Mamiya to Aiona sparked the drive, and a crucial offside penalty by Punahou on third and 1 at midfield kept it alive. Mamiya finished off the drive with a 1-yard keeper up the middle, his third touchdown of the game, and Saint Louis led 31-0 with 56 seconds to go in the half. The second half was a complete turnaround. Saint Louis, with backup Tamatoa DeMello at quarterback, failed to sustain its first three drives of the second half. Punahou finally got on the scoreboard late in the third quarter by beating a Saint Louis blitz. Kan connected with Ostrowski on a 14-yard pass to the corner to bring the Buffanblu within 31-6 with 4:27 left in the third. After a three and out by Saint Louis' offense, Kan directed Punahou on a no-huddle, 78-yard scoring drive. Kan fired a 14-yard strike over the middle to Kim, who scored for a 14-yard touchdown to bring the Buffanblu within 31-13 with 9 seconds to go in the third quarter. On the first play from scrimmage, Saint Louis turned the ball back over. Punahou linebacker Casey Shibuya stripped the ball from DeMello on a keeper, and Te'o came up with the fumble at the Saint Louis 24-yard line. Six plays later, Kan found Patrick McFadden on a crossing route for an easy 6-yard touchdown pass, and the Buffanblu were within 31-20 with 8:48 remaining. Mamiya returned to the game on the next Crusader possession, but by then, they had lost any sense of rhythm. After a three and out by Saint Louis, Punahou drove 79 yards for another touchdown. The key play came on third and 10, when Ho'oikaika Cavaco-Amoy sacked Kan for a 15-yard loss. However, Cavaco-Amoy was whistled for a personal foul when he stuck his knee into the back of Kan's head after the play as the quarterback was on the ground. On the next play, Kan delivered a 54-yard bomb to Whitford, who caught the ball in stride at the 20 and raced into the end zone. After Te'o drove over the goal line on a toss sweep, Punahou was within 31-28 with 5:14 left. StL--Shane Ahlo 29 pass from Mamiya (Chun kick). StL--Mamiya 12 run (Chun kick). StL--Mamiya 1 run (Chun kick). Pun--Miah Ostrowski 14 pass from Brett Kan (run failed). Pun--River Kim 14 pass from Kan (Kim kick). Pun--Patrick McFadden 6 pass from Kan (Kim kick). Pun--Kyle Whitford 54 pass from Kan (Manti Te'o run). StL--Josh Saio 13 pass from Mamiya (Chun kick). Pun--Ostrowski 1 pass from Kan (Kim kick). RUSHING--Saint Louis: Mamiya 8-113, Lene Auelua 6-40, Austin Wahinekona 5-14, Devan Essner 6-13, Ahlo 1-9, Tamatoa DeMello 5-8, Preston Lynch 1-5, Keani Nishigaya 2-3. Punahou: Dalton Hilliard 5-13, Manti Te'o 4-13, Whitford 1-1, Kainoa Carlson 2-0, team 2-(-30), Kan 3-(-33). PASSING--Saint Louis: Mamiya 8-13-0-127, DeMello 0-1-0-0. Punahou: Kan 33-54-2-385. RECEIVING--Saint Louis: Aiona 3-85, Lynch 2-22, Josh Saio 1-13, Ahlo 1-9, Nishigaya 1-(-2). Punahou: Ostrowski 10-121, Hilliard 8-76, Whitford 6-107, Kim 5-41, McFadden 2-25, Carlson 2-15. Kah--Shiloah Teo 2 run (kick blocked). Kah--Paipai Falemalu 10 interception return (pass failed). Kah--Alema Tachibana fumble recovery in end zone (Kaika Sasaoka kick). Kah--Teo 29 interception return (kick blocked). Kah--Nalu Carvalho 2 run (Sasaoka kick). Kah--Pita Tanuvasa 100 interception return. RUSHING--Kahuku: Lehi Aumua 15-112, Ian Fujinaga 7-36, Kaliki Unga 3-16, John Gomez 1-16, Neal Lokotui 3-12, Carvalho 2-10, Blane Beatty 3-7, Kui Naeole 1-6, Courtne Nozawa 4-5, Junior Mataafa 4-5, Kaniela Tuipulotu 1-2, Teo 1-2, Richard Torres 6-(-10). Farrington: Hercules Sula 13-30, Alefiso Iu 1-2, Joshua Fernandez 2-0, Maeli Siliga 5-(-12). PASSING--Kahuku: Torres 3-6-1-75, Mataafa 0-1-0-0. Farrington: Siliga 8-17-2-63, Iu 1-5-1-28. RECEIVING--Kahuku: Willie Ching 2-58, Aumua 1-17. Farrington: Matt Stowers 3-41, Elijah Lesu 2-11, Fernandez 2-3, Siliga 1-28, Sula 1-8. Kalh--Bruce Andrews 12 pass from Cody vonAppen (Timothy Heu kick). Kail--Darren Sugimoto 31 pass from Kortney Yano (Joshua Ferrigno kick). Kail--Yano 3 rush (Ferrigno kick). Kail--Travis Holeso-Wolfe 5 rush (kick failed). RUSHING--Kalaheo: Cody Von Appen 7-51, Chris Cavaco 3-12, Kaononohi Malama-Carter 2-5, Koakela Siliga 1-2. Kailua: Shaun Forges 7-110, Keelen Gonda 10-79, Travis Holeso-Wolfe 5-22, Zachary Akamine 3-22, William Kekauoha 1-7, Kortney Yano 1-3. PASSING--Kalaheo: vonAppen 18-29-0-252. Kailua: Yano 4-9-0-65. RECEIVING--Kalaheo: Bruce Andrews 8-99, Koakela Siliga 4-65, Kaononohi Malama-Carter 3-61, Donovan Correa 2-15, Chris Cavaco 1-12. Kailua: Darren Sugimoto 1-31, Keelen Gonda 1-17, Shaun Forges 1-13, Travis Holeso-Wolfe 1-4. McK--team 60 fumble return (Marcus Amonin kick). McK--Keawe Kalama 9 run (Amonin kick). Moan--Jordan Monico 10 run (Justin Watanabe kick). McK--Alan Hashimoto 80 pass from Tilton Kaluna (kick blocked). Moan--Monico 2 run (run failed). McK--Kalama 73 run (Amonin kick). RUSHING--McKinley: Kalama 12-145, Tilton Kaluna 3-54, Jarett Luna 1-4, Hashimoto 3-3, Josh Nakama 1-(-4), Isaac Iuta 6-(-12). Moanalua: Monico 16-104, Pono Tiave 9-58, Kirk Hubbard 12-43, Jarin Salvador-Atabay 2-28, Mark Tupas 1-16, Steven Sedenio 1-14, Robbey Eusebio 1-9. PASSING--McKinley: Kaluna 2-5-1-97, Iuta 2-3-0-8. Moanalua: Monico 6-17-2-49. RECEIVING--McKinley: Alan Hashimoto 2-86, Josh Nakama 1-17, Keawe Kalama 1-2. Moanalua: Salvador-Atabay 3-21, Savaii Eselu 1-25, Hubbard 1-3, Eusebio 1-0. Camp--Lowen Tynanes-Perez 7 run (Kia Kapana kick). Camp--Martin Kodama 9 pass from Obadiah Mataio (kick failed). Rad--Stephen Jenkins 10 pass from Justin Lord (kick failed). Camp--Mataio 1 run (Kapana kick). RUSHING--Campbell: Bronson Ellis-Rivera 16-89, Tynanes-Perez 18-70, Jesse Lee 4-5, Danilo Bantolina 1-3, Pita Feleunga 1-2, Faafetai Tuvale 2-2, Obadiah Mataio 4-1, Keneke Kapule 3-1, Jayden Ercanbrack 1-0, Team 1-(-1), Kodama 1-(-2). Radford: Ezekiel Pulou 12-37, Lord 7-20. PASSING--Campbell: Mataio 6-10-0-114, Ellis-Rivera 1-1-0-27. Radford: Lord 12-26-2-169. RECEIVING--Campbell: Martin Kodama 4-84, Anthony Rowland 1-27, Lee 1-27, Tynanes-Perez 1-3. Radford: Scott Ruehl 4-85, Kyle Blair 4-58, Travis Daniels 3-16, Jenkins 1-10. Lei--Paul Hernandez 3 run (Brayden Keawe kick). Lei--Bronson Pausa 1 run (Keawe kick). Kap--Kamuela Foki 23 pass from Mason Koa (Curtis Kiyabu kick). Kap--Koa 94 run (Kiyabu kick). Lei--Micah Abreu-Laybon 20 run (kick failed). RUSHING--Kapolei: Koa 12-143, Josh Hose 3-12, Foki 3-8, Kiyabu 1-(-10). Leilehua: Abreu-Laybon 23-129, Pausa 6-37, Bryant Moniz 3-28, Paul Hernandez 5-20, Kaipo Derego 5-20, Alex Cruz 4-16. PASSING--Kapolei: Koa 9-14-0-132. Leilehua: Derego 3-8-0-55, Moniz 3-11-0-21, Robert Siavii 1-1-0-27. RECEIVING--Kapolei: Foki 2-39, Hose 2-31, Caleb Spencer 2-26, Kiyabu 2-22, Kelii Aki 1-14. Leilehua: Martin Iosefo 2-33, Elijah Manaea 2-16, Dustin Pauu 1-27, Pausa 1-22, Abreu-Laybon 1-5. Waip--Tauave Vili 1 run (kick failed). Waip--Tyler Martin 5 run (Vili run). Waip--Vili 36 run (kick failed). Waip--Vili 5 run (run failed). Waip--Gil Fernandez 20 run (run failed). RUSHING--Waipahu: Vili 14-154, Jesse Doctolero 15-140, Joshua Abiva 5-64, Fernandez 4-36, Jamar Winston-Bautista 2-22, Martin 4-21. Kalani: Dustin Kimura 12-46, Ryan Tanaka 2-28, Chuck Ogawa 1-3, Dillon Matsuda 5-(-1). PASSING--Waipahu: Fernandez 0-2-0-0, Abiva 0-1-1-0. Kalani: Matsuda 8-23-1-77. RECEIVING--Waipahu: none. Kalani: Tanaka 3-50, Benson Gonsalves 3-15, Kimura 2-12. Waim--Newcomb fumble recovery (kick failed). Kap--Lizama 57 run (Salausa kick). Waim--Schmidt 43 run (Newcomb pass). Waim--Agor 2 run (kick failed). Waim--Rapacon 5 run (Batis kick). RUSHING--Waimea: Schmidt 25-140, Rapacon 12-57, Ramos 1-4, Agor 1-2, Palacio 1-2, Watanabe 1-1. Kapaa: Lizama 6-71, Snyder 4-14, Nakamura 5-6, Alapai 1-(-3), Salausa 13-(-27). PASSING--Waimea: Fleming 3-5-2-19. Kapaa: Salausa 4-14-0-49, Alapai 1-4-0-2. RECEIVING--Waimea: Watanabe 2-4, Rapacon 1-15. Kapaa: Nakamura 2-(-1), Velasco 1-24, Villatora 1-14, Mortell 1-14. Lah--Jacob McCarthy 54 run (Lake Casco kick). Lah--Casco 40 run (Casco kick). Lah--Bryson Williams 34 run (Casco kick). Lah--Williams 7 run (Casco kick). P3--Andrew Pacheco 2 run (Michael Jahns pass from Billy Pacheco). Lah--Williams 1 run (run failed). Lah--Blaise Smith 80 run (kick failed). P3--Billy Pacheco 13 run (Thomas Cortez kick). P3--Garrett Gonsalves 1 run (Cortez kick). Note: Individual statistics not reported.